A SeeMeQR is a QR code made from a specially crafted URL that creates a recognizable word in the QR code. SeeMeQR QR codes display words like 'INFO', 'READ', and 'VIDEO', 'MAP', 'VOTE', and more in big letters. The eye-catching words tell people up front what they will see when they scan with their smartphone. When people know what they are getting, they are more likely to follow through. With SeeMeQR QR codes, you can link your printed material to the internet more effectively, increasing the number of people who engage. These are good for any classroom use anywhere you would use a regular QR code - displays, notices, homework, etc. 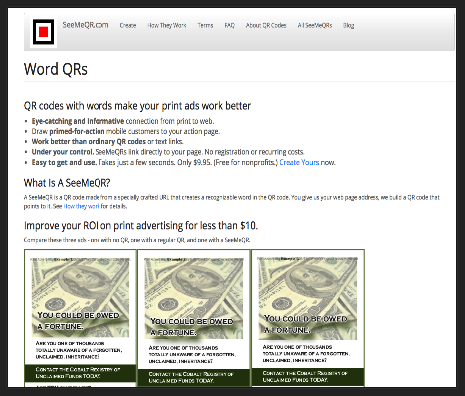 Your SeeMeQR QR code can point to any web page - your site, videos, Facebook, etc. They are easy to create and can be downloaded immediately. 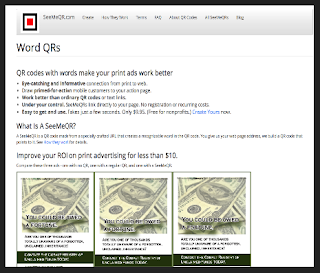 You provide the web page address you want, pick a word, and SeeMeQR builds a QR code that points to it. (Long URLs need to use a shortening service. Easy-to-follow instructions are provided.) There are 36 words to choose from right now, with more being added regularly. These are free for non-profit organizations, $9.95 otherwise. No registration required.